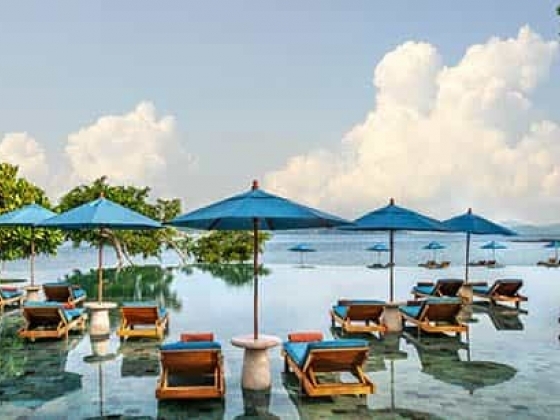 The Naka Island, A Luxury Collection Resort & Spa, Phuket is an exclusive boutique resort on Naka Yai Island, only 25 minutes from Phuket International Airport. 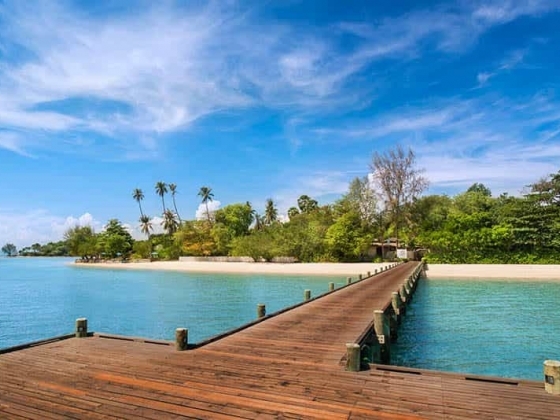 The Naka Island is accessible only by a short speedboat journey, making it a uniquely private and intimate retreat. 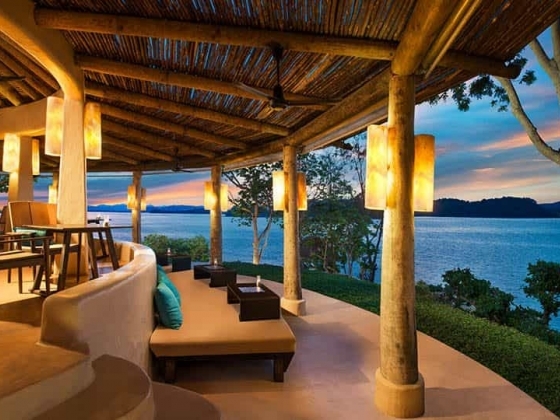 The resort offers 67 villas designed in classic Tropical Island style, with architecture and décor reflecting the indigenous culture and island surrounds. 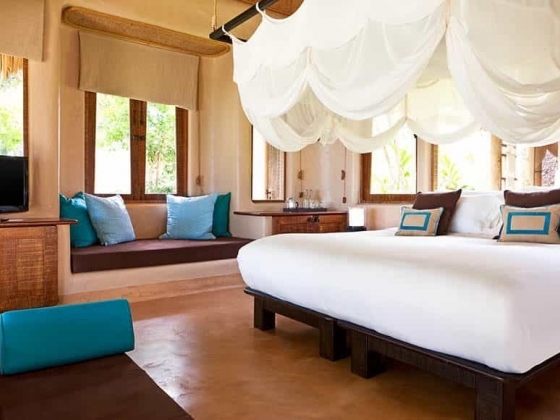 The villas feature open-air bathrooms, private plunge pools, spacious outdoor areas and Sala pavilions. 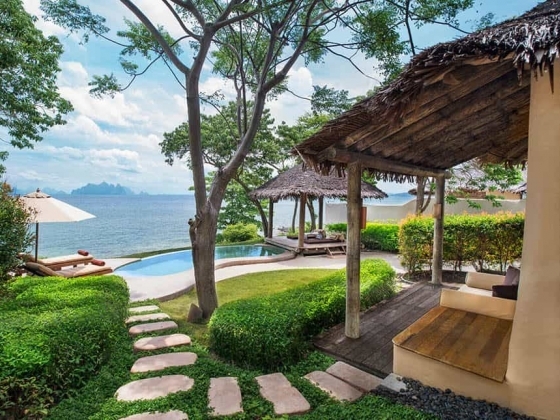 Looking out from the hilltop over the Andaman Sea, the 1,600-square-meter gated Royal Horizon Pool Villa stretches over three separate pavilions to include two bedrooms, a private living room, indoor dining areas with fully equipped pantry and outdoor poolside dining area. A captivating infinity pool boasts spectacular sea views and wraps around to meet the master bedroom pavilion, while a private sauna, open-Air shower area, bathtub and a covered Sala ensure plenty of relaxation options. This intimate villa has also been the perfect backdrop for wedding or events. 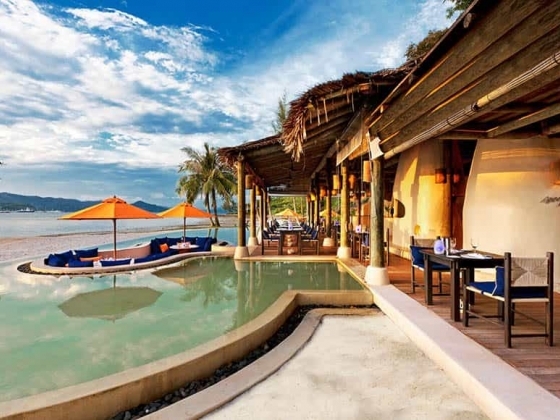 The resort features Tonsai, an all-day dining restaurant in a casual, beautiful seaside setting. 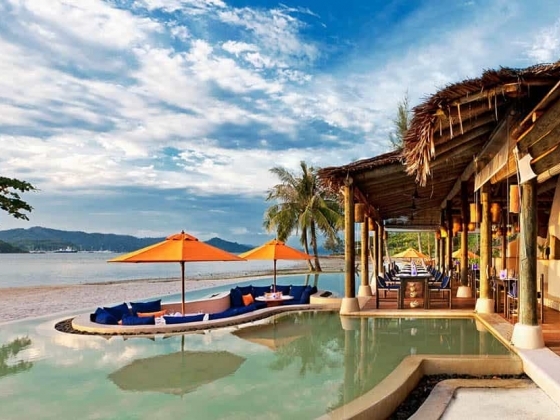 For the ultimate al fresco dining, enjoy My Grill, an open beachside grill house, offers the freshest seafood and juiciest steaks with a southern Thai influence. Or, sip on a signature cocktail from Z Bar's extensive cocktail menu while enjoying a spectacular sunset over the ocean. 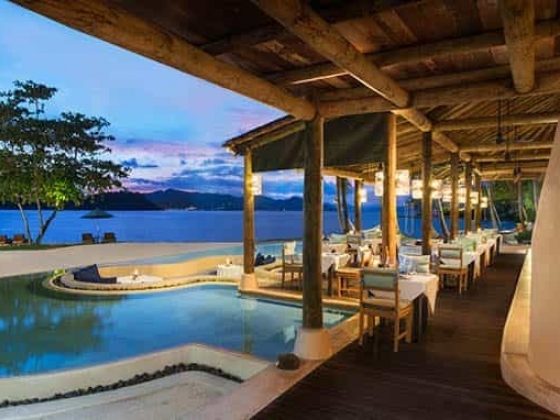 If eating in is more your style, let The Naka Island's experienced chefs prepare a spectacular feast for you at your villa, or a packed gourmet picnic or even a private dinner on the beach. At the resort, guests can take advantage of the 24-hour fitness center or indulge in the resort’s horizon swimming pool. To discover the unparalleled nature of Naka Island, guests also have many options for the recreation; from standing up paddleboard, kayaking to bike tours. 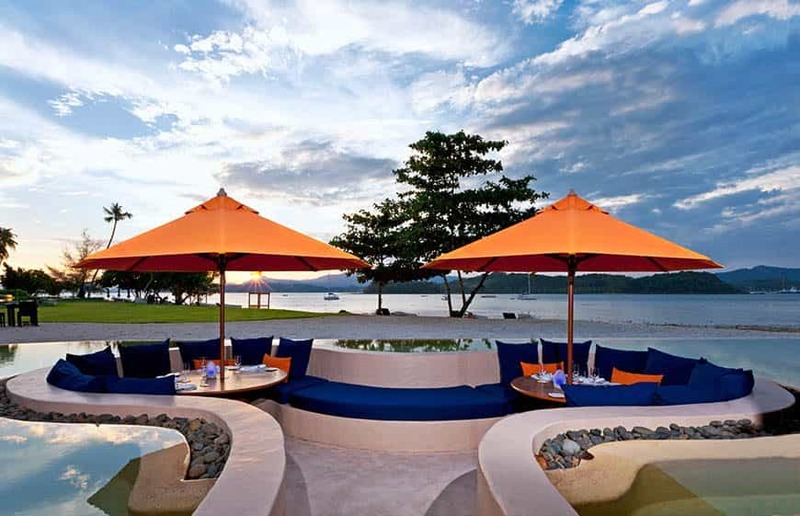 The resort's concierge can organize day excursions to all areas of Phuket and nearby islands. 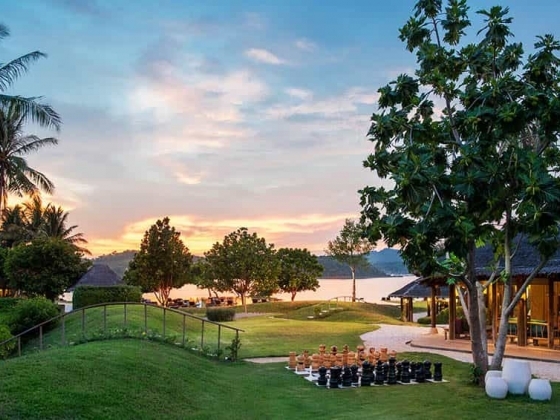 In order to experience the indigenous charms of Thai culture, an authentic Thai cooking class and Thai Boxing are the perfect options. Whilst we are popular for honeymooners and couples at The Naka Island, we do also have kid activities including Balloon arts, Face Painting, Windmill Making, Batik Painting and a kid’s game room. Spa Naka offers eight private treatment suites, including outdoor rainforest showers, a steam room, a souna room, an ice room. The signature Watsu treatment, a 60-minute-aquatic therapy with combination of shiatsu pressure points, gentle stretches and the absence of gravity to help alleviate those aches and pains and keep guest on track for the challenges day to day life. Other unique discovering rituals are accessible for you to experience. 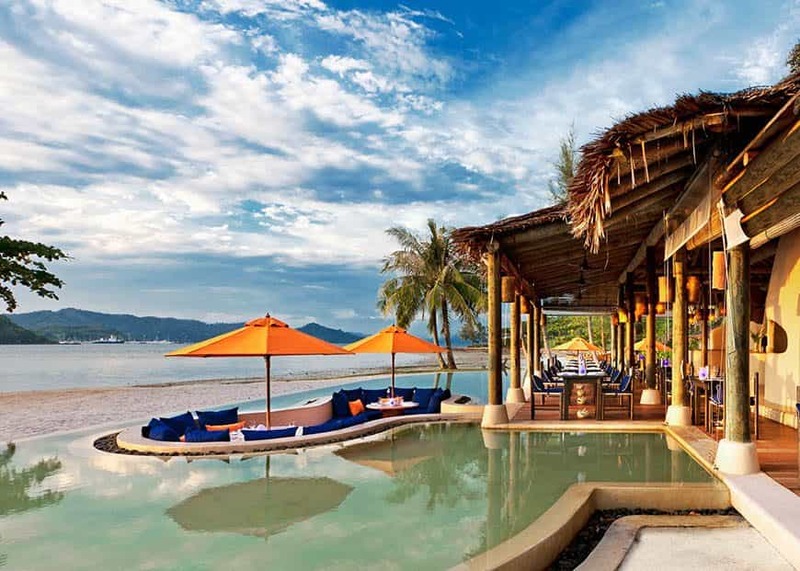 The Naka Island's exquisite location overlooking the Andaman Sea and across Phang Nga Bay offers an idyllic venue for intimate beachside weddings, or for customized social and corporate functions. A seemingly effortless level of attention will ensure that every function is unforgettable. Swimming Pool Our large freshwater pool offers the singular experience of swimming while gazing out over the sparkling ocean and Phang Nga Bay. 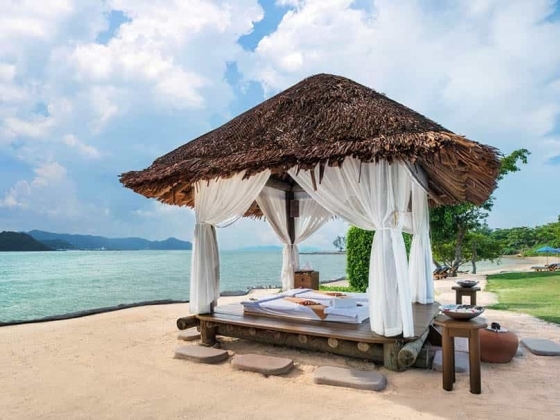 Spa An unparalleled sanctuary, Spa Naka is nestled on a private island, free of all distractions and dedicated to guests’ well-being. 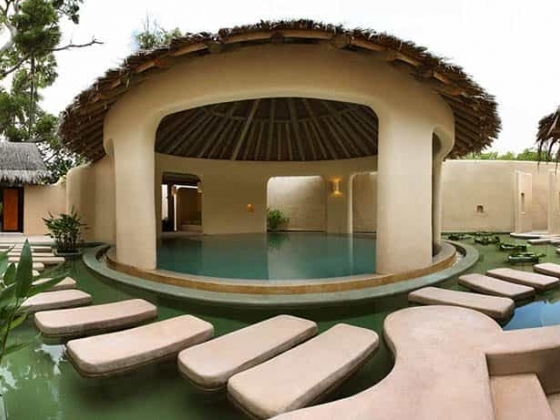 The four serene treatment rooms offers premier therapies for the body, mind, and spirit. We visited Naka Island for our 20th Anniversary and we held our Vow Renewal ceremony there. 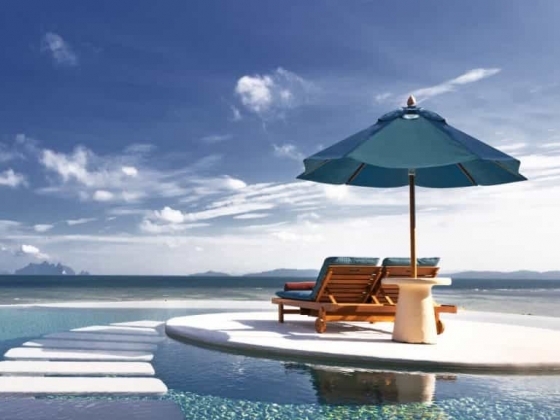 This place is lush, romantic and luxurious with amazing views of Phang Nga Bay. 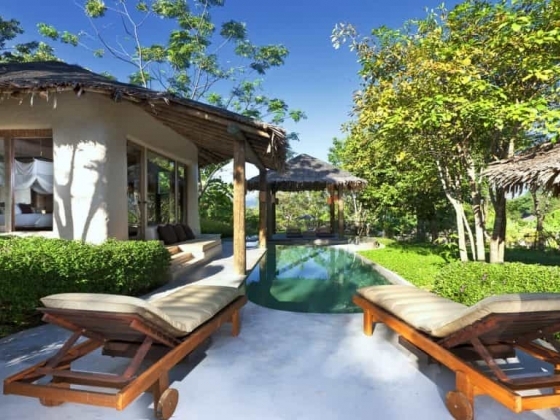 The grounds and Villa are impeccably cared for with discreet but cheerful service. 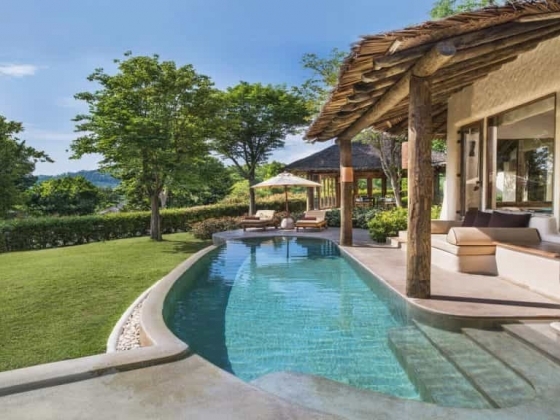 We were completely cared for and pampered by Naka staff in every venue: airport pickup, speedboat transfer, restaurants, in-Villa dining, recreation and concierge. The Event Mgr (Jay) was super wonderful before, during and after our ceremony, which was carried out perfectly. The GM, Concierge (Ya) and the My Grill/Tonsai Mngrs also were very nice to us and made sure we were happy. 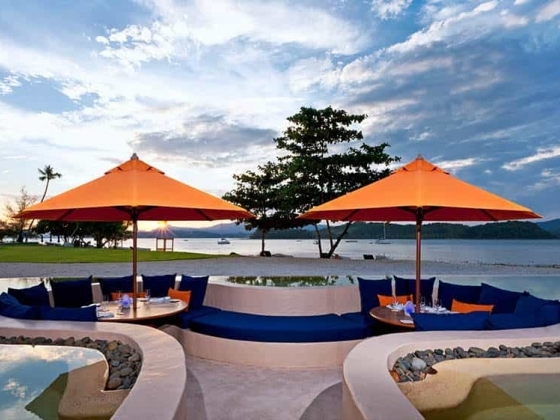 We highly recommend Naka Island and look forward to a return visit soon!